Argentina continue to top the CONMEBOL table after their 2-1 away win against Chile last night. Chile fell asleep for 4 minutes in the first half and allowed Messi and Higuain to claim a quick brace in 28 and 31 minutes. Argentina then needed only to hang on to claim 3 points but they did concede a late Gutierrez consolation. In Puerto La Cruz, Ecuador recorded a fine away draw against Venezuela to bolster their qualification chances. “La Vinotintos” took the lead, with what must have been the goal of the night through Juan Arango. The veteran captain collected the ball 30 yards from goal then unleashed an unstoppable howitzer past the flailing Dominguez. In Asuncion, Pablo Aguilar claimed the only goal of the night to win the bottom of the table clash against Peru. Barring a small miracle neither team should be in contention for the qualification spots. The surprise of the night was in La Paz where Bolivia hammered Uruguay 4 -1. Carlos Saucedo grabbed a hat-trick to condemn Uruguay to their second defeat in five days. Luis Suarez got one back near the end. Concern must be growing for” La Celeste” as they have managed to take only one point form three games, two of which were at home. The COMNEBOL table seems to splitting in 3 parts with Argentina, Ecuador and Colombia moving away slightly form the pack. That being said two positive results can alter qualification chances dramatically and no team is in the clear yet. Week 9 saw Argentina, Ecuador and Colombia win and move away from the pack. The qualifying group has now split into 3 parts with Chile and Uruguay losing form in the last 3 games. Messi was at his imperial best against Uruguay. It has often been touted that little Leo does not perform for his country and cannot replicate his Barcelona form. This qualifying campaign, and the recent Brazil friendly largely dispels this myth. His second goal was particularly impressive. It wasn’t as spectacular as his recent free-kick against Real Madrid but it was the apparent simplicity and ease in his execution to slip the ball low past the keeper. In Quito, Ecuador finally broke down a stubborn Chile after initially going behind. A couple of rash challenges had Chile eventually go down to 9 men and Ecuador took full advantage. Their tormentor in chief was Felipe Caicedo who continued his impressive international form and scored his 3rd and 4th goals in 3 games. Man of the moment Radamel Falcao scored a brace against bottom dwelling Paraguay while in La Paz, Bolivia and Peru recorded 1-1 draw helping neither of their qualification chances. Such is the format of South American (CONMEBOL) qualifying that one double header of matches can drastically change the various team standings. While Bolivia,Peru and Paraguay look to be increasingly separated from the pack all the other teams still have realistic chances of qualification. Especially with 5 possible berths for Brazil up for grabs. Unsurprisingly Argentina lead the pack but only by a solitary point over Ecuador and a resurgent Colombia. Of all the teams to compete next week Argentina, Chile, Uruguay and Ecuador have the most to gain with 2 matches each. The only problem is they are competing for the same 6 points. The glamour tie on Friday is Argentina vs Uruguay with Messi, Arguero, Tevez against Suarez, Cavani and Ramirez. A win for either may see them top the table, a loss and it’s a long plane journey to their respective away ties following. 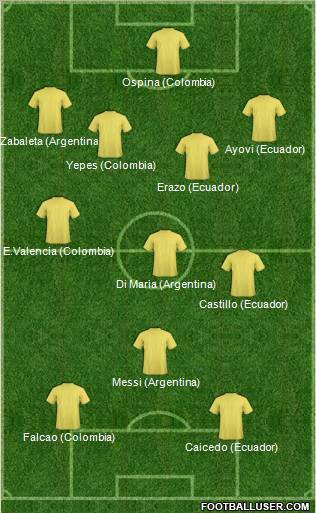 Ecuador have two winnable games against Chile at home the Venezuela away. 6 points would see them rocket to the top depending on Argentina’s results. Pantomime villain Joey Barton recently received a 12 match ban for his behaviour on the last day of EPL season. The severity of the punishment has been debated at length but what is not in doubt is the recidivist nature of this repeat offender and his apparent refusal to learn from his mistakes. From stubbing a cigarette in the eye of a youth player, attacking team-mates and opponents to serving 77 days in prison for common assault the QPR midfielder has a litany of misdeeds and he seems intent on adding to them in the future. That being said despite having a record “as long as his arm” Barton still has a fair way to go to match the exploits of one of the most colourful goalkeepers of modern, football history: José René Higuita Zapata. The goalkeeping idol impressed and horrified with equal measure and why he didn’t have his problems to speak off the pitch, in the main he was forgiven because he never failed to dazzle and entertain when playing for his country and many clubs. For many the abiding memory of Colombia’s Rene “El Loco” Higuita will be his “Scorpion Kick” against England in the old Wembley Stadium in 1995. The game was inching along to a 0-0 draw when Jamie Redknapp mishit a shot/cross from the right hand side. Higuita, maybe bored with the evening’s events, needed only to catch the aimless ball but instead opted to dive forward and clear using the soles of his boots. It was a marvellous footballing moment which left the crowd and TV spectators enthralled and would become Higuita’s signature play piece .One that he would happily re-enact many more times in the future; mainly for the press. 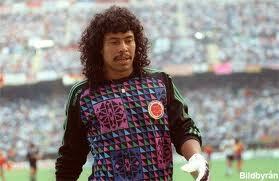 “Some people say you have to be a little crazy to be a good goalkeeper,” Higuita told a journalist years later. For “a little crazy” (or poco loco) we should read as mad as a bag of ferrets. Alike many South American footballers a young Rene grew up in poverty. He was raised by his grandmother in a barrio of Medellin during a time when Colombia was plagued with violence and was fast turning into the world’s number one narco-state. At 19 he made his league debut for Millonarios of Bogota, the historical giants of Colombian league football making 16 appearances and scoring 5 goals (a feat he would regularly go on to replicate).Despite this successful first season he opted to return home to Medellin and join his beloved Atletico Nacional who were being funded and largely controlled at the time by the infamous Pablo Escobar. His new team-mates included the likes of Faustino Asprilla, Leonel Alvarez, Andres Escobar and Albeiro Usuriaga, who would all go on to be integral parts of the coming Colombian football renaissance. Under the tutelage of legend Fransisco “Choco” Maturana , Atletico became the first Colombian team to win the Copa Libertadores when they beat Olympia of Paraguay in one of the most famous of finals. After clawing back a 2-0 deficit the 2nd league of the final in Bogota was tied 2-2 on aggregate and so moved onto penalties. The shoot-out presented the opportunity for Higuita to become the hero and it was an opportunity he did not waste. By this time Rene was a regular penalty taker so he stepped up to score Colombia’s third and save five of the opposition’s kicks, four of which were in sudden death. His last sudden death, penalty saves allowed Leonal Alvarez to claim the winner. When Choco Maturana took over Colombia for Italia 1990 he used Higuita and his Atletico team-mates as a base of the squad. Combined with Carlos Valderrama and Freddy Rincon they had an impressive squad of hungry, young players. A 2-0 win against the United Arab Emirates, a 1-0 loss to Yugoslavia and a 1-1 dramatic, last ditch draw against West Germany saw them qualify for the next round for the first time. Their reward was a last 16 tie with the tournament surprise team Cameroon. Almost as much as the “Scorpion kick” Rene Higuita is remembered for his mistake against Cameroon and their captain, Roger Milla. To modern day supporters his daredevil antics near the centre circle appear foolhardy and selfish but that is to ignore the benefits of having a goalkeeper who also acted as a sweeper and creative influence upon the team. In addition to this he was an attacking option and a potent threat from set-pieces. Although his goal scoring record could not match a centre forward (or Jose Luis Chilavert) it puts many a defender or midfielders rate to shame. To have such an all-rounder must have been quite a weapon in your armoury especially as he was an accomplished shot stopper and top level goalkeeper to boot. Unfortunately, this time Higuita came unstuck and was robbed of the ball far up the pitch leaving his goal open for Milla to slide home the decisive winner. He was made to look stupid as he scrambled back to his goal, this time his audacity and adventurous spirit resulted in Colombia’s elimination. Despite their World Cup disappointment Colombia continued to blossom as an international force. 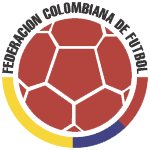 Second and fourth places in the 1991 and 1993 Copa America’s were coupled with a first place position in the 1994 World Cup campaign. A 5-0 final game defeat of Argentina, in Buenos Aires was the cherry on the cake. Now everyone had to sit up and take notice of the “Cafeteros”. Many, including Pele were touting them as favourites for the World Cup in USA. But before this disaster had struck for Higuita struck in the form of Pablo Escobar and his corrosive, influence upon both the Colombian people and its football. The fascinating documentary “the two Escobars” highlights the relationship between Rene Higuita and the infamous drug king-pin. The Zimbalist brother’s excellent piece of work directly correlates Colombia’s period of success with the Narco-lord’s age of rule and “El Loco” was right in the middle of this relationship. During the early nineties Colombia was actively trying to combat the narco -traffickers and improve its dreadful international reputation. Escobar had been given a pseudo jail sentence by the authorities instead of extradition to the USA and a likely death penalty. His jail was a self-regulated palace located high in the mountains far away from the media spotlight. He still continued to control his empire and his power was such that he would summon the Colombian national team to play private matches in the “prison” courtyard/pitch. Whether the players wanted to play in these matches is debatable but I doubt many would openly defy the demands of noted gangster and mass-murderer. Higuita on the other hand seemed to enjoy a close relationship with Escobar: in much the same way as many of the 1960’s London based footballers mixed with the Krays and other cockney villains. When people grow up in poverty it creates a bond which is hard to break and forges lifelong friendships. While this may be incomprehensible to the more fortunate and higher classes it is normal for those less lucky. Regardless the goalkeeper felt no reason to publicly deny his and Escobar’s amity. In 1993 when he decided to visit his old friend in prison the press were waiting for him. Footage of Higuita running from the reporters was beamed around Colombia and the world severely embarrassing the Colombian government and forcing them into action. When Higuita was employed as an intermediary in a Medellin kidnapping case the authorities seized their opportunity to punish and exact retribution. Higuita received payment ($50,000) for his “go-between” duties and as a result it was argued that he had profited from the crime instead of informing the authorities. The result was a seven month jail sentence which immediately ruled him out of the next year’s World Cup. Without their goalkeeper USA 1994 was disastrous for Colombia. They were caught out against a counter-attacking Romania and the brilliant Hagi losing 3 – 1. 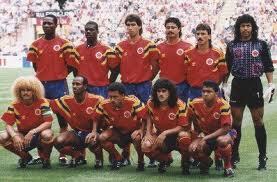 Then came the 2 – 1 defeat to the USA and Andres Escobar’s own goal. 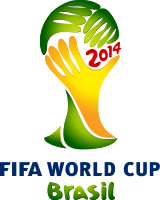 In the end the 2 – o win against Switzerland was meaningless and they were home before the postcards. It could be argued that a nervous Oscar Cordoba failed to inspire where Higuita had before, but considering the pressure they were under from personal and family death threats it was amazing they even entered the pitch. The murder of Andres Escobar shortly after further highlighted how poisonous life was for people at this time. 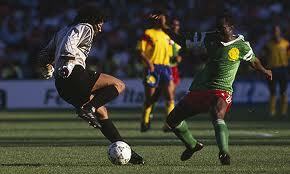 It was harsh lesson for Higuita. The government had deliberately made an example of the goalkeeper but at the same time they contributed to their football team’s demise. 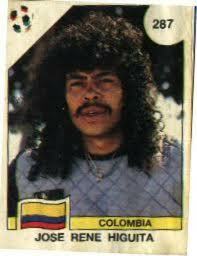 Although Carlos Valderrama was their captain Higuita was their leader and inspiration. In much the same way as Alesandro Pirlo with his penalty against England, a leader can engender confidence in his team with acts of audacious skill and bravado. Nowadays commentators near wet themselves when a goalkeeper races up the pitch to try and meet a last minute cross or corner with a header. Higuita on the other hand could take the ball from his own box and dribble past the opposition or lay-off passes before even reaching the half way line. With all that was hanging over them Colombia needed their talisman to bolster their shaken nerves. Incarcerating the footballer with trumped up charges was merely a smokescreen for the authorities’ displeasure of his relationship with Pablo Escobar. His term of jail ended his World Cup career as by the time France 1998 he was much older and past his prime. For many of his former team-mates it proved also to be a tournament to far contributing again to early elimination. In 68 appearances he scored 3 goals for Colombia and played in the two Copa Americas and only one World Cup. 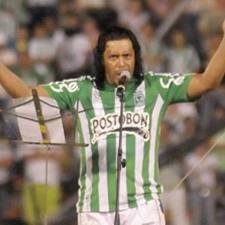 Although Rene ventured abroad during his career: Mexico (Tiburones Rojos de Veracruz or the Red Sharks of Veracruz), Spain (Real Valladolid) and Ecuador (Aucas) for single seasons it was Colombia that saw the best of Higuita with a variety of clubs, but most notably Atletico Nacional. He finally retired in 2010, after a couple of come-backs, with a total of 380 appearances and 25 goals a few and became a goalkeeping coach of Real Vallodolid then Al Nassr FC of Saudi Arabia earlier this year. If he can somehow influence a next generation of players with his type of approach to the game through coaching or mentorship then maybe all is not lost. He will always be associated with his acts of madness or genius by either admirers or detractors alike but what is of no doubt is there is a severe dearth of mavericks like him in the modern game. Just like Maradona, Best and Gascoigne, Higuita was a flawed genius and it is probably these human deficiencies combined with their ability to marvel and astound that make us love and miss their likes all the more.